Where do I go in Unify Desktop to complete my partial shipments? 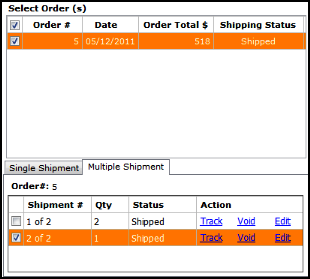 1) Choose the order from the Inbox tab with the status of Partial Shipped, then click Process Shipping. 2) Select the next unshipped quantity. Click edit to choose the quantity of items you want to ship. Once items are chosen, click Save and Close. 3) After the items are selected the status of the shipment is changed to Items ready. The shipping parameters can be chosen to ship the second shipment. Click Generate Label to ship the final order. 4) When all items have been shipped the status of the order is changed to Shipped. 5) Each sub-shipment can be tracked or voided from within the multiple shipment area or in the Tracking tab next to the main shipment details.